A tinkling sound drifts to me upon the warm summer breeze as I lay in the cornfield. I smile at the sound for it is the sound I have longed for all day, for all eternity. It is the sound of your laughter. I know you are near but teasingly you do not approach. Instead your laughter lures me and like Alpheus I flow though the cornfield following the sweet sound of my Arethusa. Quickly you dart like a sprite always one step ahead. I hear you but I cannot see you. I close my eyes and stand still, arms outstretched. I let my ears do the seeing. Your joyous sound tinkles once more and I shift and stumble slightly towards you. Your laughter increases, I’ve amused you, but I feel you draw closer. Still I cannot see you, I choose not to. I feel more together with you this way. You laugh again, like a silver bell. I’m drawn like a fish in a net, I drift towards you. I’m clumsy at first but you’re patient. You don’t run too far ahead, but your laughter has an excitement to it, I can feel it. I can’t help but smile as I follow the sound, gradually learning to swim amongst the corn as you do. 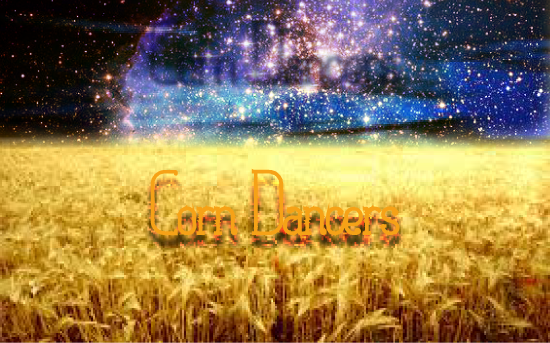 We dance, we corn dancers float together, the corn always just coming between us but your laughter ever more joyful. I’m swept away, my eyes still closed, I need them no longer. You have me riding currents within the corn, currents of rapture. Soon I no longer feel the corn I only feel the rapture. My body feels light, but I notice your laughter has stopped. You speak instead. “Open your eyes” you whisper, close to my ear, I feel your breath.